TARPS produces effective covers for many custom applications. Roll-Tarps for trucks, wagons, trailers are custom fitted for excellent fit. 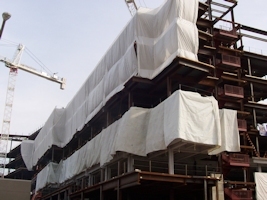 Containment Tarps are hard wearing and high density tarps excellent for use in blasting, spray applications, and specialty construction needs. Tarps Manufacturing, Inc. is a subsidiary of Illinois Road Contractors, Inc. (3X3C7) In business since 1925 as a privately owned family business. Tarps has been in operation since 2004, and is wideley known as a high quality producer of reliable tarpaulin style products.